Our blog will be 1 year old in 2 months. I can’t believe we’ve been baking a different type of cupcake almost every weekend for the last 10 months. That sounds like a lot of cupcakes! We’ve come up with 36 different flavors and posted them up here (there were a few duds that we haven’t posted). Someone asked me a couple weeks ago if we ever run out of cupcake ideas. While we haven’t yet, it got me thinking. I think we’ve gone through a lot of basic cupcake flavors, now it’s time to get into some new flavor combinations. 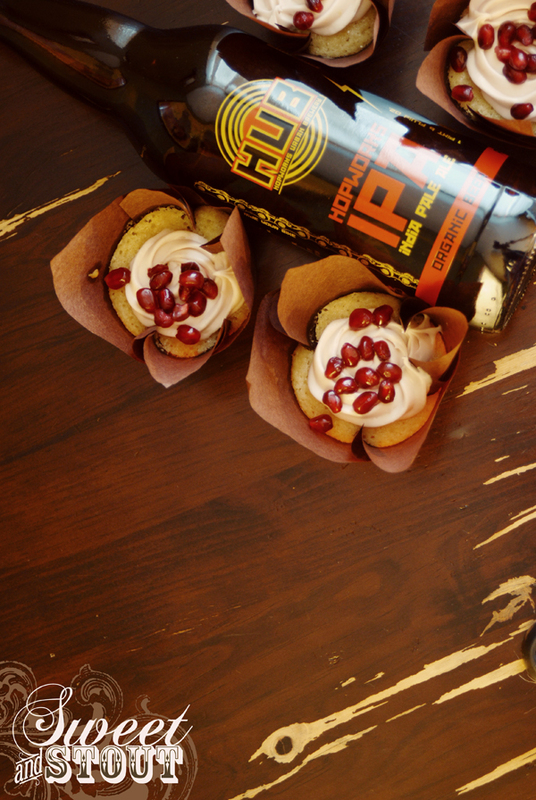 To start off our new flavor pairings, we bring you these Lemon Pomegranate IPA cupcakes. I sent Dylan off to the store to find a nice hoppy IPA to match with the lemon cake I wanted to bake. He came back with 4 different bottles (it was difficult to choose)! This round we decided to use Hopworks Urban Brewery’s IPA, a balanced blend of hops, bitter, and a bit of a citrus flavor. A perfect pairing for the zesty lemon flavor in this cake. The cake itself has the zest of 2 lemons, plus a bit of extra lemon juice, along with a full cup of IPA. I reduced a bit of pomegranate juice and added it into a cream cheese frosting, stirred in some more lemon zest, and piped it on the cakes after they had cooled. 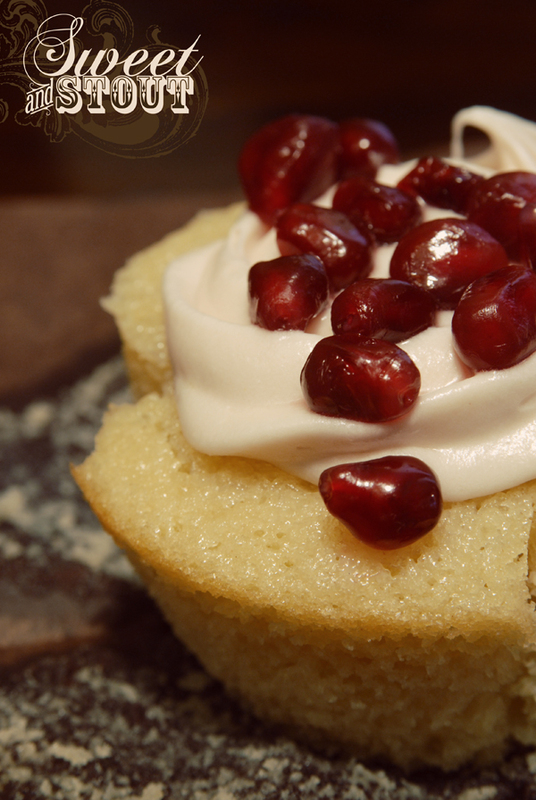 As a garnish, I placed a small spoonful of pomegranates seeds on top. Not only did they look pretty, they added a lot of flavor to the whole package. 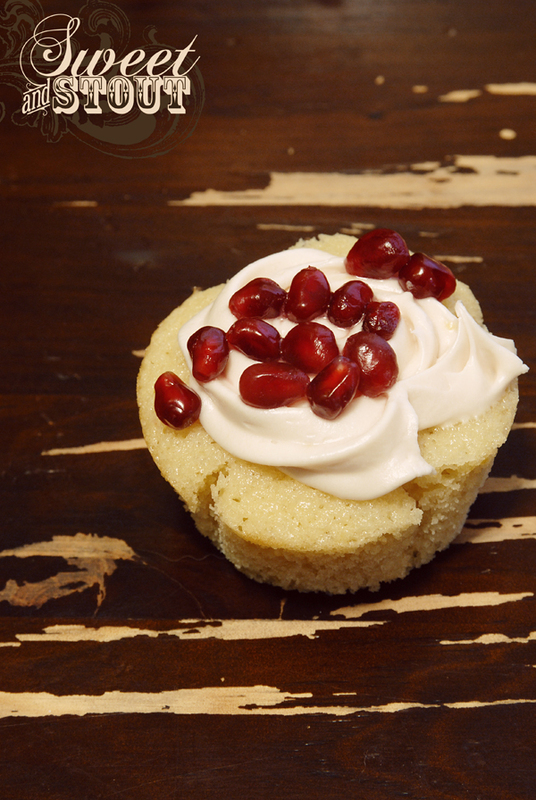 As you take a bite of the soft lemon cake, you get a rush of pomegranate juice from the seeds, it’s quite delicious. We’re hoping to add a few more flavors to our official flavor list soon. It’s been a little crazy in our house lately, planning a wedding and all. If you have any suggestions on what you’d actually like to be able to purchase (here in Spokane, sorry, no shippy yet), we’d love to here from you. Let us know!